The Muskee Creek runs from its confluence with the Maurice to about three miles inland, and it then branches into a number of different streams at what was once Jones’ sawmill. 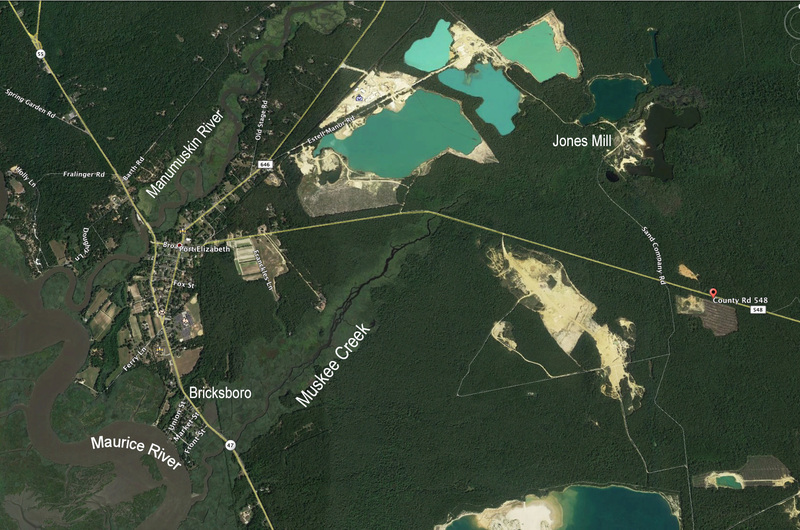 The site of Jones’ Mill is noted on modern-day maps where a number of sand mining ponds converge. The watershed itself is about 5 miles long from its confluence with the Maurice to just south of NJ Route 49 below Estell Manor. At the river’s mouth lies the historic village of Bricksboro, abutting Port Elizabeth, NJ on NJ Route 47. Much of the forested land along the creek is a NJ Wildlife Management Area. All of the Muskee falls within the Pineland’s National Reserve and it remains typical of many pinelands streams. 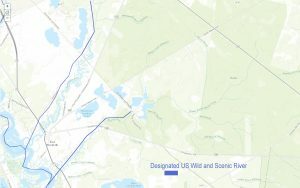 The Muskee Creek drainage area covers about 12,825 acres or 20 square miles, and lies entirely within Maurice River Township. 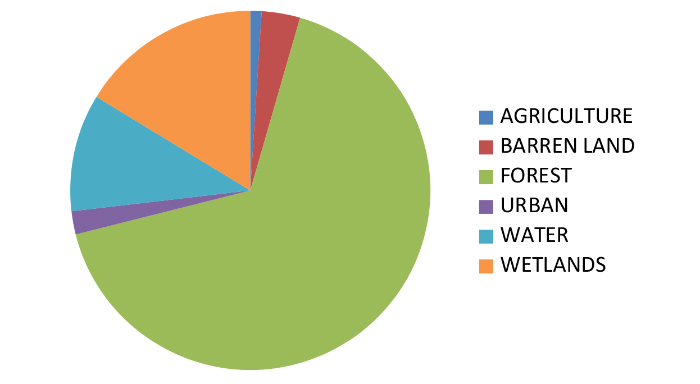 The land cover of the Muskee is 67% forest, 27% wetlands and water, 3% barren land, 2% urban, and 1% agriculture. 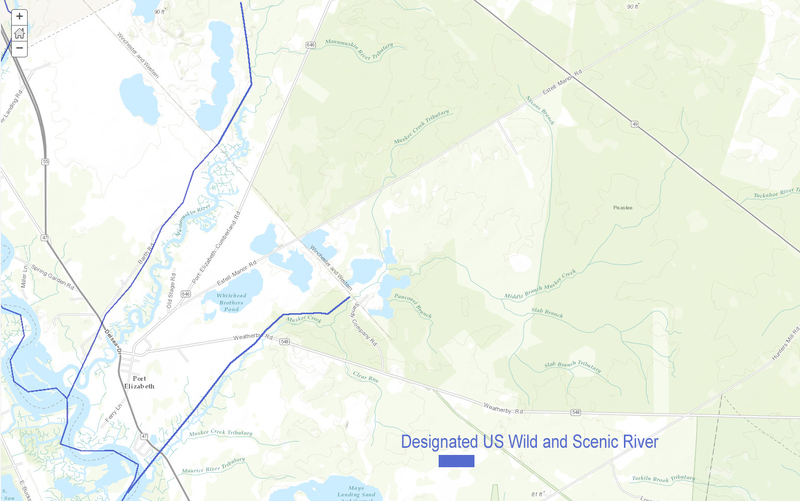 The US Department of Interior National Wild and Scenic designated portion of the Muskee Creek begins at its confluence with the Maurice and ends at the PA Reading Seashore Line Railroad Bridge (historically the West Jersey RR) just upstream of County Route 548. Bricksboro sits on the northern bank of the Muskee where it meets the Maurice River; situated there is the Joshua Brick house built in 1810. 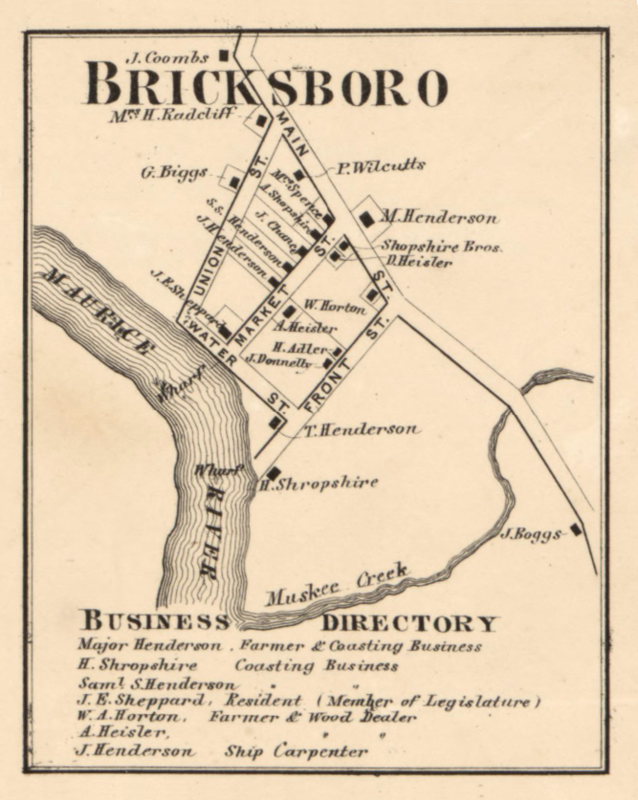 Bricksboro, established in 1807, is named after Joshua Brick who sold lots and established the small village. Joshua Brick is also known for having been a major force behind the construction of one of Cumberland County’s most famed icons, the East Point Lighthouse. In 1849, this entrepreneur wrote to US Congressman Charles Brown, requesting the establishment of a lighthouse at the mouth of the Maurice River. 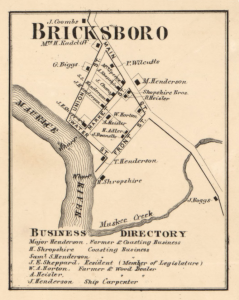 In its heyday Bricksboro had many commercial establishments. The Bricksboro Hotel was operated from 1813-18 and again in 1823 by a variety of managers. This was a busy hamlet. The location of Joshua Brick Store in 1797, Elridge’s Ferry in 1810, farmed plots, a wood dealer, and a ship’s carpenter all are marked on various contemporary maps. A survey done by David Kingsey in 1831 shows Compton Ferry to be just north of the mouth of the Muskee Creek. Today it is a small neighborhood of approximately 20 homes. Other historic aspects of the once-active village of Bricksboro can be explored on Charles Hartman’s map of the area. Upstream was Jones’ Mill, now destroyed. It was active from 1740 until the early 1900s. Herbert Vanaman, in his book Maurice River Town, noted that the area was good for sand mining. F.W. Bowen, in History of Port Elizabeth, Cumberland Co., NJ (1885), states that mining was expanded greatly between 1865-85 and is “now one of the most important industries, due to the nearness of shipping facilities and the source of supply, and unlimited deposits of marketable sand and gravel. The industry has, of late, standardized its product to meet the varied requirements of the market efficiently. In the past, sand was shipped “bank run”, but today it is washed, screened and graded and mixed according to the specification of the consignee. There are at present about 70 standard grades of sand shipped from this section to all parts of the United States and even to foreign countries. The combined capacity of the sand plants in Maurice River Township is about 5000 tons daily, operation at 100 percent production.” In fact a sand mine interrupts the river just upstream of the wild and scenic designated section. Today sand mines may not be placed within stream corridors or wetlands. But sand does remain an important export. For two hours on either side of high tide, the Muskee can be enjoyed by canoe or kayak. The lower section is phragmites-infested but the upper section, a half-mile southwest of Weatherby Rd., is quite lovely and worth a visit.